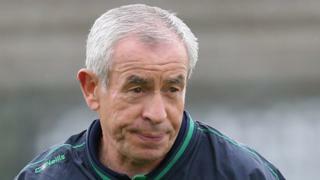 Pete McGrath praises his Fermanagh team after they secure the point they needed to stay in Division Two of the Football League. Defeat to the already-promoted leaders Tyrone would have meant an immediate return to Division Three for the Erne County. But it finished Fermanagh 0-12 Tyrone 1-09 for a point apiece at a tense Brewster Park.